With only six ingredients these Creamy Dreamy Strawberry Whipped Keto Pops are the perfect frozen treat for sticking to your keto diet plan, and for indulging in something deliciously sweet, but without all of those pesky carbs! 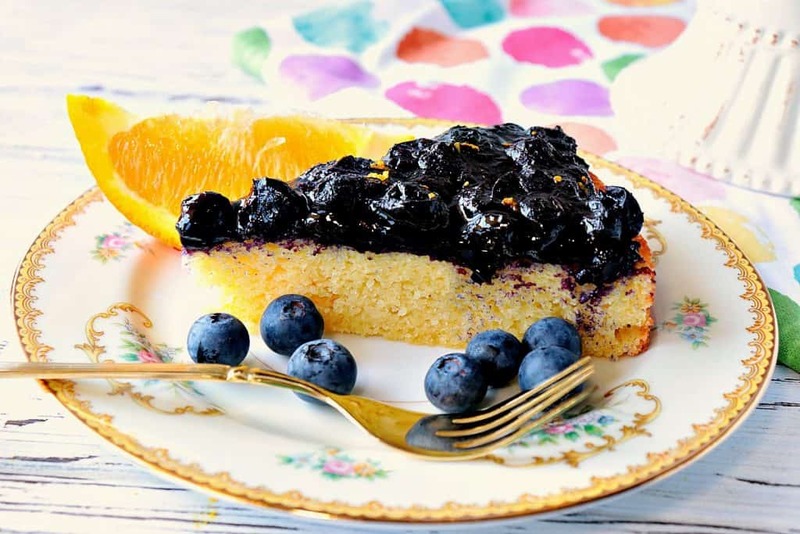 Easy to make, delicious to eat! Here at my house, we’re trying hard to lose weight by sticking to our new keto lifestyle eating plan. 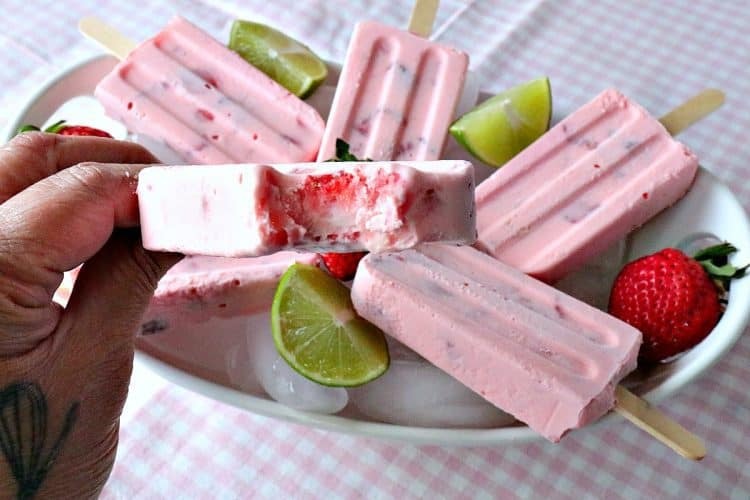 If you’re unfamiliar with the keto diet plan, it’s basically avoiding unhealthy carbohydrates and incorporating healthy fats into your daily eating, which is why I developed this recipe for Frozen Strawberry Whipped Keto Pops. **Please Note – The printable recipe card with detailed instructions and complete ingredient measurements for making Frozen Strawberry Whipped Cream Keto Pops is available near the end of this post. 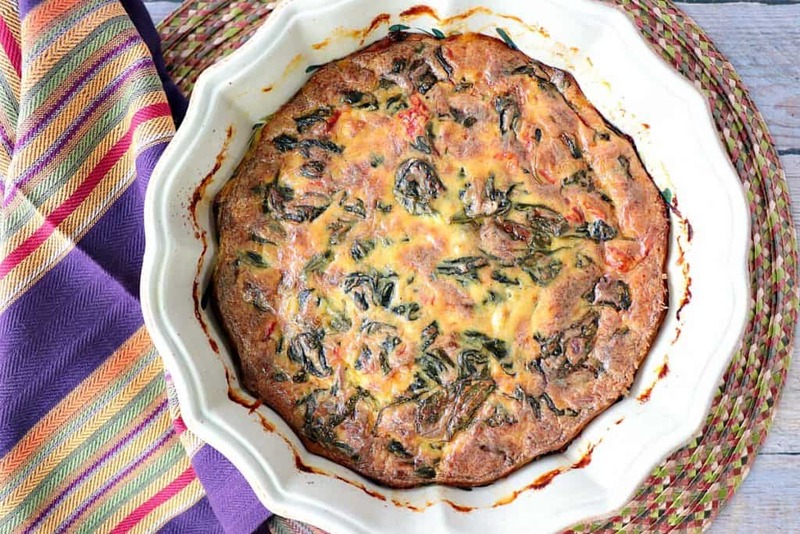 While it may seem counterintuitive to indulge in dishes made with heavy whipping cream, bacon, cheese, avocados, and eggs, after researching the keto eating plan you’ll find that these are the foods that feed the brain and encourage fat loss in the human body. Contrary to what we were taught in the past, fat (good fats) don’t cause body fat. Sugar does. If you’re interested in learning more about the keto eating plan, there is a wealth of information on the internet. Naturally, you’ll read good things, and not so good things about the keto eating plan, but that’s basically true about anything and everything under the sun. What I do know is that we’ve been having success with the plan after the first month, and hardly ever feel hungry. In addition, I’ve basically never once craved high starch foods like potatoes or bread since starting. I call that success right there! 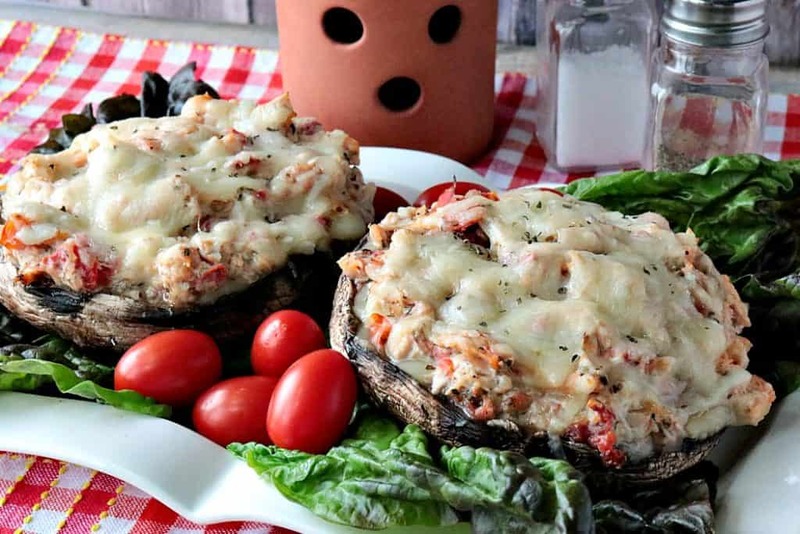 **I’ll make sure to leave a few informative links about the keto eating plan at the end of this post if you’re interested in finding out more. 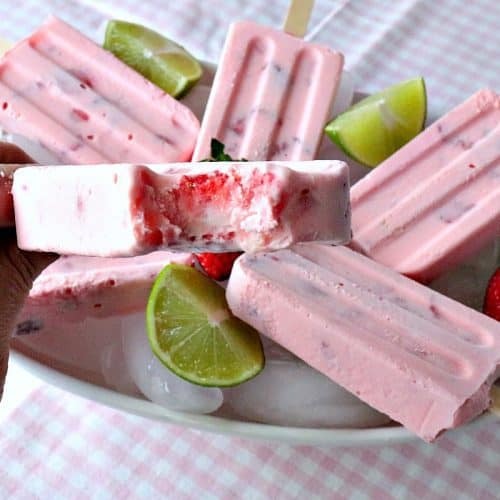 **The following affiliate links are some suggested products I’ve chosen that will aid you in the making and serving of this recipe for Strawberry Whipped Cream Keto Popsicles if desired. 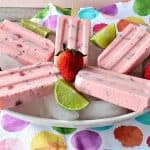 But now, back to our recipe of Creamy Dreamy Frozen Strawberry Whipped Keto Popsicles which are not only for those of you on a keto eating plan! I guarantee that EVERYONE will love them…even the kids! Roughly chop approximately ½ pint of fresh strawberries. In a large bowl, whip the heavy cream until soft peaks form and then add the protein powder (optional) and swerve sweetener. Fold the almond extract, chopped strawberries and a drop or two of red gel food color (optional) into the whipped cream mixture. Add fresh lime juice to the strawberry whip and spoon the mixture into the pop maker. Freeze the pops for 60 minutes then add the sticks to the pops. To remove the pops from the form, run the individual plastic pop under hot water or dip into a bowl of hot water. 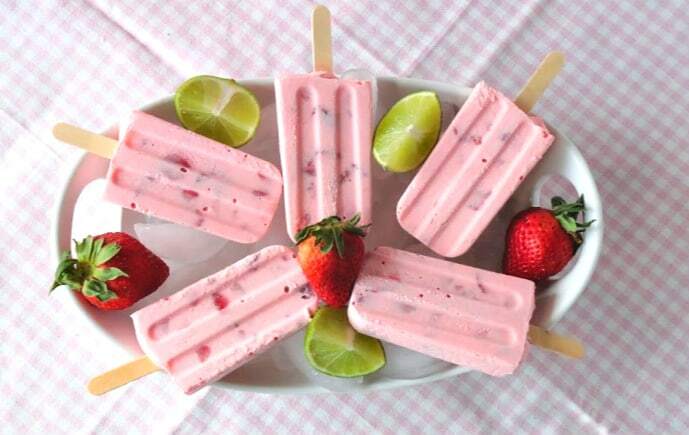 Gently pull the stick to release the strawberry cream popsicle from the form, and enjoy!! 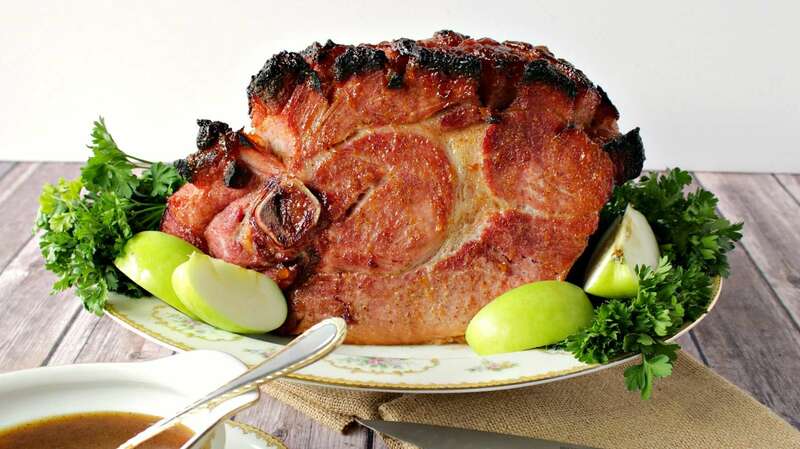 Why add lime to the recipe? Can I leave it out? You can leave it out, but I wouldn’t suggest it! 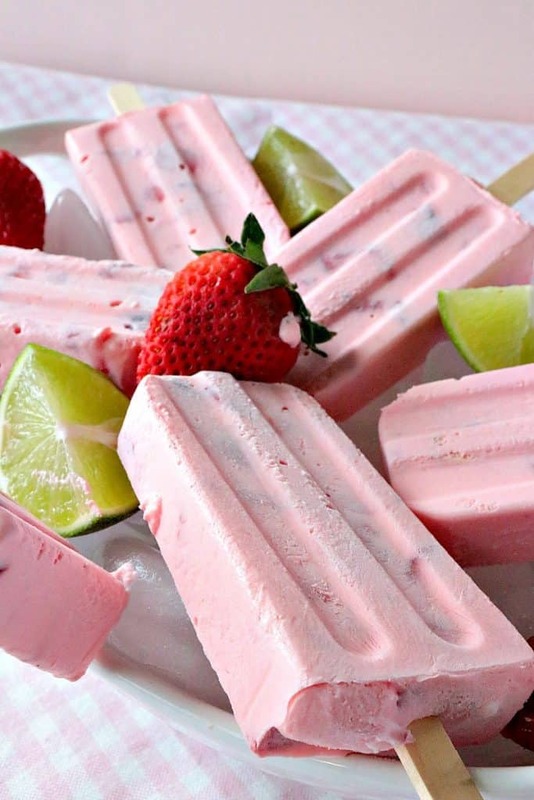 Because of the high-fat content of these strawberry whipped cream pops, the added lime juice cuts through that heaviness and gives brightness and lightness to these pop that really makes them, well, POP with flavor! A stand mixer will make it easier to whip the heavy cream, but it’s not necessary. A good hand mixer or some good old-fashioned hand-whipping will also work. It will only take a little longer. For any of these methods, start with a bowl and beaters that have been well chilled for optimal whipping. Take a bite out of cool and creamy deliciousness! Below is the printable recipe card including the nutrition information for today’s strawberry cream keto popsicle. 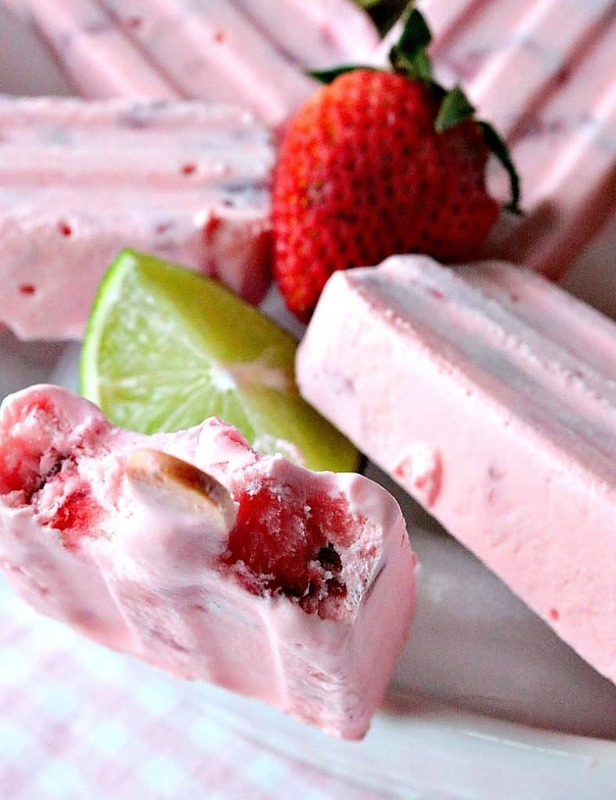 With only six ingredients these Creamy Dreamy Frozen Strawberry Whipped Cream Keto Pops are the perfect summertime frozen treat for sticking to your keto diet plan and for indulging in something deliciously sweet. Whip the cream in a large bowl until soft peaks form. Gently fold in the chopped strawberries, lime juice, protein powder, almond extract, and swerve sweetener. Add the gel food color (optional) and stir to combine. 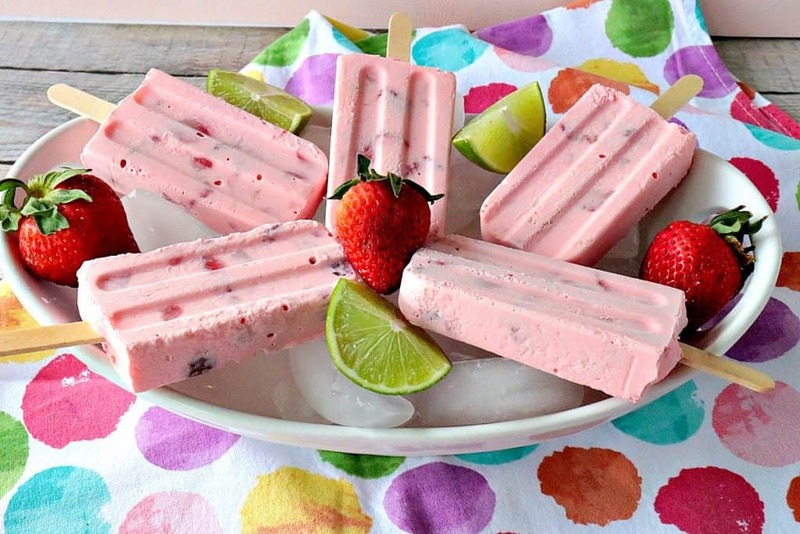 Spoon the strawberry whip into pop molds. 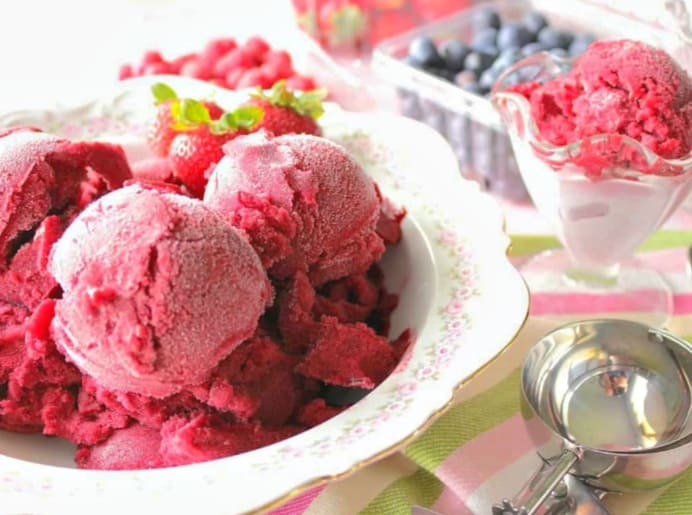 Freeze for 1 hour. Insert a popsicle stick, return to freezer and freeze until firm. large bowl, hand mixer, or stand mixer, spatula, cutting board, paring knife, measuring spoons, measuring cup, popsicle mold. Once frozen, to release the pops from the mold, run the plastic under running water, or dip the plastic pop molds into warm water for 5-10 seconds. Gently pull to release. As promised earlier, below are a few keto diet information links. I am in no way advocating this diet plan for you, or your family. It’s just something that I and my husband family feel confident in, and are seeing results with. Please do your own research and make up your own mind as to whether this eating plan is right for you. I hope you’ve enjoyed this recipe for Low-Carb Strawberry Cream Popsicles as much as I’ve enjoyed bringing it to you!! Should you have any questions or comments regarding this recipe for Frozen Strawberry Whipped Cream Popsicles, or anything else you’ve seen on my site, please don’t hesitate to contact me directly, or leave me a comment in the comment section below. It is always my distinct pleasure to get back to you with a reply just as soon as I possibly can! It’s called SWERVE sweetener and it’s an all-natural sugar replacement. You can find it in any grocery store in the baking aisle. These are super pretty! My kids will love them! Hidden sugar is a terrible problem in packaged foods. Even if you’re not eating a keto diet, you’ll still enjoy these. I served them to company and everyone loved them. Oh wow, these are fantastic!! My kids would LOVE them! These must be in my freezer at all times! These would make a great treat for my boys after a hard day of work on the farm! These sound so refreshing for summer! Yum!!! Can’t wait for make it, and for my kiddos to try it. Now I can give them something they like, that is healthy!!! Thank you so much. These are my favorite keto snacks! I just know you and your kids will love them,Johnna! Enjoy!! These pops are the perfect treat! My daughter is a strawberry fanatic, these are right up her alley! This makes me happy. Thanks, Wilhelmina! Thank you! Low carb bars like this are so expensive in the market. Good point! They’re also filled will all sorts of additives. This way you’re getting the best of both worlds. Less expensive and better quality!